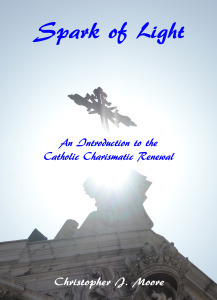 My recent book ‘Spark of Light: An Introduction to the Catholic Charismatic Renewal’ has been published on Amazon and is available in the US, UK and elsewhere. The title of this short book is taken from the encyclical Pacem in Terris (Peace on Earth), issued by Pope Saint John XXIII on Holy Thursday, April 11, 1963. In it he said, ‘Every believer in this world of ours must be a spark of light’. In 2007 after attending a prayer group and a number of conferences I was touched by the Catholic Charismatic Renewal (CCR) and experienced new impetus in my faith. However, heeding the advice in St Paul’s first letter to the Thessalonians: ‘test all things’ (1 Th 5:21) I embarked on a search to discover whether CCR was merely the impulse of man seeking a more emotional and lively religious experience or a genuine outpouring of the Holy Spirit. This book is the result of that quest. This book is now available as both an eBook and in print and has sold copies in the UK, US, Germany, Italy and Australia!